UPDATE 09/14/2010: Invicta II Men’s Diver “Sandstone Material” dial as it is now being described, is going for $83.21 and three value pays of $27.74. UPDATE 09/09/2010: After a week and half, Team Invicta responded to the origin of their “Natural Sandstone” dials confirming what we already know – that they’re about as natural as Pergo wood floors. “After speaking extensively with numerous experts, there seems to be confusion between the term Sandstone as used in jewelry and sandstone the raw dessert like sand material found in nature. What we are using is absolutely sandstone as known in the jewelry world and is considered a gemstone. That is why when you search the term “sandstone Jewelry” or look at all other vendors you will find a broad selection of jewelry with the same material used as in our sandstone dials. Many stones are modified, bonded, compressed, heated, dyed, bombarded, etc., for use in jewelry. The main reason being one of hardness, since in order to cut semiprecious stones for jewelry or dials you need a minimum hardness of 5-6. Some stones are rare and turned to dust and then compressed with natural, others have a tradition of going by the wrong gemological name such as black onyx which is also dyed black Agatha. No one sells Ruby as a chemical compound (mineral) and tell you its pure aluminum oxide. No one sells Lapis as a Rock, or a diamond as carbon. A gemologist explained it as follow: Sandstone in the Jewelry industry is a sedimentary rock composed of tiny grains of quartz or feldspar. It can be any color, but is most commonly tan, brown, yellow, red, grey or white. The color is usually dependent on the region in which the stone was found. Sandstones are formed by cemented grains of small fragments of pre-existing rock or crystals and are usually bound together by calcite, clays or silica. The sedimentation process occurs when sand grains are bounced along the bottom of a body of water or ground surface, resulting in a pressure compacted mixture. Because sandstone widely varies in its creation, its hardness widely varies as well. Uncle Lalo still didn’t address the lack of discernible depth and that only three “crystal” images are arranged in a repeating pattern. But I suppose the ardent – at this point seemingly moronic – über fans will find this response enough. UPDATE 09/05/2010: I was able to find out a few more details regarding specifics on the dial. First, the actual thickness of the dial confirms that it is not a slab of sandstone. It is 10 nanometers thick. The thinest that the professor has ever saw sandstone cut is 30 nanometers. The dial may not even contain natural sand. Looking at it under a microscope reveals that the shiny bits have no dimensionality; not appearing as three dimensional pieces, instead lacking any discriminable depth. Like the difference between a hardwood floor and a laminate. One is the real, three dimensional object that includes the grains. The laminate is a pictorial representation of the same thing. Also of note is that there are only three distinct shapes that all of the crystalline structures share. In natural sand, the variation approaches the infinite. These two facts seem to even contradict Eyal Lalo’s statement that actual sand was used in the manufacture of these dials. THERE is still no explanation from Invicta. In his second statement, he’s admitting the sand is bonded onto a medium and a dial is cut from it. This is NOT natural sandstone! This is a composition mimicing sandstone and he is admiting as much. The name of the geologist mentioned below has been passed to Jim Skelton for further discussion of his findings; his identity is not being made public at his request. 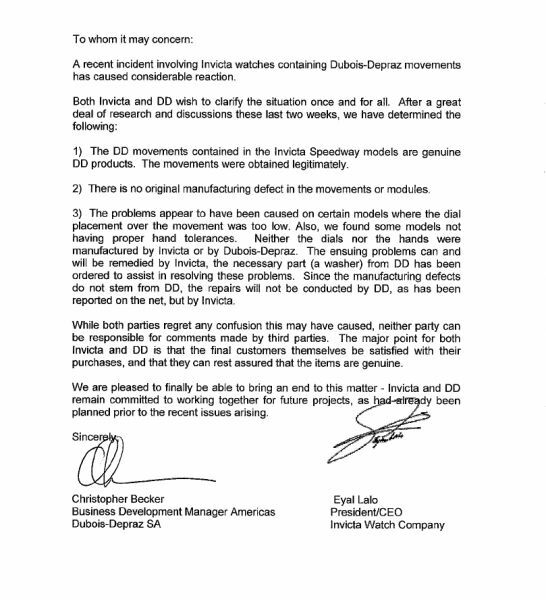 ON this last day of August, the Invicta Watch Group did not disappoint by offering up the trifecta scandal to end the summer of 2010 that has seen a major debacle every month. This time it is the apparent bogus claim of natural sandstone dials. THIS investigation was initiated by a member of Watchlords, GEEKNOMO, a disillusioned former member of Watch Geeks who obtained a sample from his model 0050, Invicta II Blue Sandstone with Diamond accents. He believed all along, based on color and a close inspection, that it appeared to be a man-made material. After attempting to burn it he felt that it was actually a type of glass. Upon further research, he settled on the conclusion that it was aventurine glass. While I never doubted his belief that it wasn’t sandstone, I know how Eyal Lalo and Jim Skelton on behalf of ShopNBC, attempt to cause confusion when presented with fact. I personally felt it needed confirmed by an expert. With help from a fellow member of Watchlords, that is exactly what happened. The sample was shipped to, and examined by a prominent faculty member of the Colorado School of Mines. He believes that it is a glass matrix with manmade crystals floating in it. He rated the hardness on Mohs scale at about 5.5: consistent with glass. Unfortunately, the schools directors have a policy that prohibits any documentation to accompany this finding but they routinely examine samples of materials provided by the public, but the Doctor who examined the sample is an expert with nearly 30 years in the field of geology. IT was just a few days ago that Eyal Lalo responded on a question and answer Watchgeek thread that the dials are “Natural“. One is reminded of Mr. Lalo’s supposed “loud talks” with Dubois Depraz, a company that did not have any business relationship with IWG and Swiss labeled watches as being entirely Swiss made, another untruth revealed as Watchgeeks popped the backs off of their “Swiss” made watches to reveal movements stamped “Far East Assembly” as well as the revelation of fake diamonds on the Classique womans watches marketed by both ShopNBC and Invicta. WILL this revelation prompt someone to have a meteorite dial examined to determine if it is genuine? Are the diamonds on the bezel of the 0050 model real diamonds or crystals? Check back for more updates as this story unfolds.